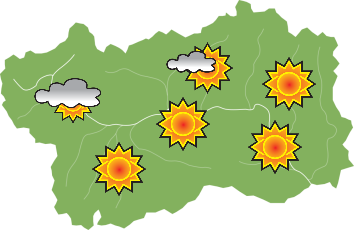 The weather forecast given on the website provides information on the weather conditions in the region, the forecast for the next 3 days and coming trends. The Webcam page provides photographs taken every hour from 8.00 to 17.00 in 30 of the most spectacular locations in the region and the main ski resorts, in order to provide accurate information on the snowing system. An update on all the downhill slopes of the Aosta Valley. An update on all the cross-country trails of the Aosta Valley. Brochures to download, site search engine, services and useful contact numbers for your safety. Alternatives to using the car when visiting the Aosta Valley.